June 2018 | MMA Fighting Events Videos Techniques UFC Fight Picks and News. The UFC is finally back on track putting on fights that fans want to watch! 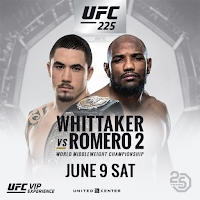 Let's face it, 2018 has been a subpar year to say the least as far as PPV events go, but UFC 225 is a nice looking fight card headlined by a rematch between Robert Whittaker vs Yoel Romero. Their first fight was fun to watch and I expect the rematch to be just as exciting if not more. As Chingasos MMA readers know, we pick winners! In 2017 we went 10-2 and so far in 2018 were already 4-1. 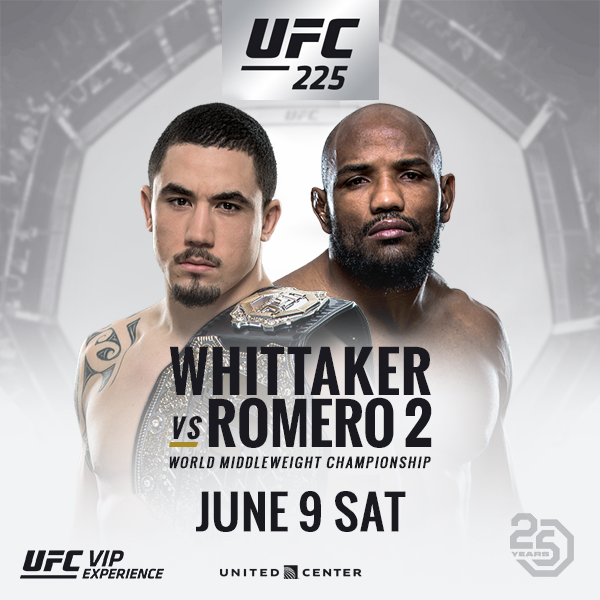 Let's get onto the fight pick and preview for UFC 225: Rober Whittaker vs Yoel Romero. Yoel Romero comes into this rematch with an overall MMA record of 13-2. He's beat some of the best in the UFC's middleweight division, Luke Rockhold, Chris Weidman, Ronaldo Souza, and Lyto Machida have all fallen victim to the strength, power and technique of Yoel Romero. His only loss in the UFC has been to the champion Robert Whittaker and that fight went the distance! Yoel Romero deserved a rematch for the title earlier, but Robert Whittaker was hurt, so he took on Luke Rockhold and stamped his ticket to a rematch with an explosive KO victory. Yoel Romero has Olympic level wrestling, a lot of power, strength and explosiveness. His stand up seems to improve every fight but his gas tank is not the best. Whittaker was able to fend off takedown after takedown forcing Romero into deep waters where his gas tank became an issue Whittaker then used his stand up and chingasos to win rounds and take the decision. Robert Whittaker comes into this fight with an overall MMA record of 19-4. Whittaker hasn't lost a fight since 2014! Whittaker can finish fights, he has 9 KO/TKO's on his resume and 5 submission. Robert Whittaker has some of the best stand up skills in the UFC. And, a killer takedown defense as he showed in the previous match up with Yoel Romero. If Whittaker wants to stand and throw chingasos, no one has stopped him from doing that! This time, Yoel Romero will be more conservative with his takedown attempts. Look for the fight to start a lot slower than their first match up. The strategy will drastically change for Romero, and Whittaker will have to adjust. In this fight, there will be heavy power shots and exchanges. I see Whittaker winning most of those exchanges. Apparently, so do the odds makers because Whittaker is almost a 3 to 1 favorite. Whittaker is the better striker, he'll fend off most if not all takedown attempts. Yoel Romero knows this. So, look for Romero to fake takedowns this time and throw some heavy chingasos when Whittaker bites on the faints. Whittaker will land more, but look for Yoel Romero to land that onee hard brain rattling chingaso. While the odds are against Romero, keep in mind Whittaker is coming off a knee injury. If Romero can hit that knee, slow Whittaker down just enough, and catch him when coming in or out of takedown attempts, Romero will surprise many. I don't see a surprise, I see old man strength and power overcoming youth and speed in this fight. Yoel Romero will end up with his hand raised when it's all said and done. Unfortunately for Romero, he will not be champion as he weighed in 2 oz over the 185 lbs limit. But, a win will most likely set up a trilogy fight. Who do you have winning?